Yemen’s former president, Ali Abdullah Saleh took over North Yemen in 1978, and became president of the whole republic after its two halves were united in 1990. The only man to ever serve as president of a unified Yemen, he proved to be a wily political operator, manipulating the country’s tribal system and fending off sustained insurrections in the north and south. He often portrayed himself as the only man who could hold Yemen together. In the early days of the months-long popular campaign to drive him from office, Saleh portrayed the opposition as a conspiracy to destroy the country – a theme he has struck often during his decades in power. But his reign was also defined by charges of corruption and mismanagement: At the onset of the uprising, Yemen was one of the poorest countries in the world, with widespread unemployment and persistent inflation. Its billions of dollars in oil revenues embezzled or wasted. Forty percent of Yemen’s population lived on less than $2 per day. Following months of protests in 2011, Saleh’s reign ended after he signed a deal brokered by the Gulf Cooperation Council (GCC), in which he agreed to step down after months of unrest. But he resurged when he allied with Houthi fighters in 2015. Just days later, Saleh was killed on December 4 at the age of 75. His death is expected to have major implications for the war in the Arab world’s poorest country. Saleh was born in 1946 in the town of Bayt al-Ahmar, a member of the Sanhan tribe. His early career was spent in the military. He fought for the republican government in North Yemen’s civil war, which pitted the Saudi-backed remnants of the monarchy against the Egyptian-sponsored republicans. Expectations for his presidency were low. An estimate from the US Central Intelligence Agency predicted that he would not last six months in office. But he held on, consolidating power within the ruling General People’s Congress (GPC) and buying the support of the country’s fractious tribes. He was re-elected in 1982, and again in 1988. Saleh was an ally of former Iraqi strongman Saddam Hussein, and his decision to back Iraq during the first Gulf War had serious consequences for Yemen’s economy. Saudi Arabia responded by expelling more than a million Yemeni workers from the kingdom, depriving countless Yemeni families of vital remittances. After the September 11 attacks, Saleh tried to position himself as an important ally to the United States. He made an official visit to Washington in 2007, where he met with then-president George W Bush at the White House. And he allowed American drone aircrafts to kill alleged al-Qaeda targets on Yemeni soil. Yemen, in return, has been the recipient of tens of millions of dollars in American aid. After his ouster, the UN Security Council found that he amassed between $32bn and $60bn through corruption during his 33 years in power. The 2015 UN report stated that Saleh’s assets were stashed in at least 20 countries, and the team planned on investigating the former leader’s connections with businessmen, who were helping him hide the funds. Saleh’s failures as president fuelled months of popular protests which began in January, shortly after the ouster of Tunisian president Zine El Abidine Ben Ali. Protesters spent months camped in front of Sanaa University, where they erected tents and chanted for his resignation. Demonstrations also spread to several other Yemeni cities, with the southern city of Taiz emerging as an epicentre. The turnout at some rallies reached hundreds of thousands of people. Several high-ranking military officers deserted Saleh after a particularly brutal crackdown on March 18, when at least 50 protesters in Sanaa were killed by snipers. General Ali Mohsen Saleh was the first to go. He ordered the troops under his command to protect protesters.The protests were at first led by students and young people, but they eventually grew to include much of Yemen’s fractious opposition. The Houthis, Shia rebels in the north who have fought a long-running war with Sanaa, endorsed the protest movement; so did the Southern Movement, the secessionist group in the south. The protests also emboldened the Ahmar family, fellow members of Saleh’s Hashed tribal confederation who have emerged as his chief political opponents. Hamid al-Ahmar, a prominent businessman, was seen as a possible successor to Saleh, while his brother, Hussein al-Ahmar, quit the ruling party in February and publicly rebuked Saleh. He later offered to step down, promising to hand power over to a civilian government. The opposition rejected that offer, holding out for a more immediate resignation. Neighbouring countries tried to broker a peaceful exit for Saleh. A proposal negotiated by the Gulf Cooperation Council would have granted Saleh immunity from prosecution in exchange for stepping down. But he refused – on three different occasions – to sign the deal. Saleh transferred power to his deputy ahead of an early election, and in return he received immunity from prosecution. 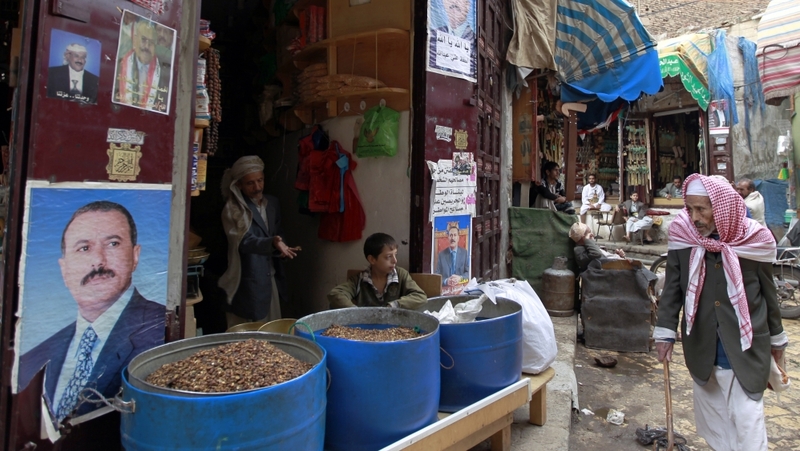 But Saleh’s patronage network began to shrink as Yemen’s oil reserves began to dry up. The country’s oil production peaked in 2001, and has been declining ever since. Some of the tribal unrest Saleh faced right before his ouster was due to his inability to “spread the wealth” as he once did. He also failed to resolve ongoing conflicts with both the Houthis and the Southern Movement. The southerners have temporarily dropped their demand for secession – calling instead for Saleh’s ouster – but their longstanding economic grievances remain unaddressed. READ MORE: Military action in Yemen – Who’s for, who’s against? Following months of protests in 2011, Saleh’s reign ended after he signed a deal brokered by the Gulf Cooperation Council (GCC), in which he agreed to step down after months of unrest. However, a few years after he was deposed, Saleh resurged when he allied with Houthi fighters in 2015, after his home was targeted in Arab coalition airstrikes. Before that, he had asked Gulf countries for safe passage out of the country. There have been constant skirmishes between the country’s government and Houthis since 2004, with most of the fighting limited to the group’s stronghold in northern Yemen. Then in 2014, the Houthis took control of Yemen’s capital, Sanaa, and proceeded to push southwards towards the country’s second-biggest city, Aden. In response to the Houthis’ advances, a coalition of Arab states launched a military campaign in 2015 to defeat the Houthis and restore Yemen’s government. The UN decision came after thousands of Saleh and Houthi supporters filled the streets of Sanaa to protest the punishment of the former president in November 2014. In 2016, during the revolution’s anniversary, Saleh made a rare appearance at large gathering in Sanaa. He attempted to offer an olive branch to the coalition. “We extend a hand of peace, the peace of the brave, for the direct talks with the Saudi regime without a return to the (UN) Security Council, which is incapable of resolving anything,” Saleh told the crowd. That same year, he signed a Houthi appointed political council that allowed them to run country from Sanaa. He blamed the rebels for the country’s crisis, calling on forces loyal to him to ignore orders from the Houthi leadership. The Houthis accused Saleh of staging a “coup”. Yemeni officials told Al Jazeera that Saleh’s decision to break the alliance was planned in Abu Dhabi earlier this year. Al Jazeera later also received confirmation of Saleh’s killing from his political party, the General People’s Congress. There were earlier reports that the Houthis blew up one of Saleh’s houses. Houthi source said Saleh was killed by the rebels in a rocket-propelled grenade and shooting attack on his vehicle. “The ministry of interior statement announces that they have taken over all the positions and strongholds of the treacherous militia in the capital Sanna and the surrounding areas, as well as other provinces in order to impose security,” Houthi TV announced.